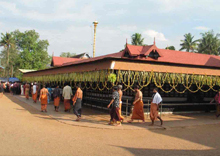 God's own country is replete with temples and pilgrimage centres, each of which has a legend or an anecdote connected to its origin. According to legend, Brahmin warrior Parashuram, an avatar of Lord Vishnu, reclaimed the land of Kerala from under the sea with his pickaxe. Most of the temples are centuries-old and are thronged by devotees from all over the country. 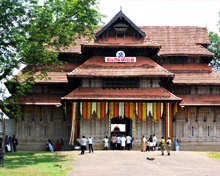 There are strict restrictions being observed in Kerala temples as per age-old customs. While men have to remove their shirts and wear dhoti, womenfolk are allowed only in saris. Only oil lamps are lit at the sanctum and the temple premises are kept very clean. 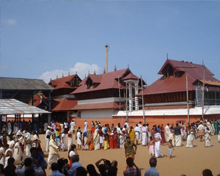 Usually foreigners are not allowed into temples in Kerala. This grand temple dedicated to Lord Vishnu is situated in the heart of Thiruvananthapuram, the capital of Kerala. It was established by the ruling family of erstwhile Travancore dynasty. King Marthanda Varma dedicated his entire kingdom to the Lord and ruled as obedient 'daasa' (servant). As the tradition continued, the priceless treasures in the temple vaults remain safe. The temple has a100-feet high gopuram built in the Dravidian style of architecture. The idol of main deity Lord Vishnu is seen reclining on Anantha, the serpent. The idol is made of a rare combination of rocks not seen elsewhere. You have to view the gold plated idol part by part from three windows. The 'pradakshina' (walking around the abode of the deity) will give one a good experience of the antiquity of the temple with its myriads of statues and idols. The vast expanse of the temple with its well-maintained lake nearby gives a good account of the religiosity of this ancient city. 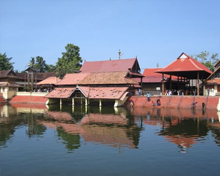 Located on the outskirts of Thiruvananthapuram, the shrine is dedicated to Goddess Parvahty. It is just a few minutes journey from East Fort bus terminus. Women devotees on a certain day between February and March cook a delicacy called Pongala (a mixture of rice, jaggery, coconut and ghee) in new mud pots on make shift stove (traditional) on the premises to propitiate Devi. Thousands of devotees line up the main thoroughfare of the capital with their cooking utensils, mud stoves and wood and prepare the special dish on the roadside. It is an ancient temple built in the early 17th century. Lord Krishna is worshipped as 'Unni krishna' in the form of a child. It is well known for the delicious 'Palpayasam' served as an offering. During medieval times, the main deity of Guruvayoor temple was brought here for safekeeping when Emperor Tipu Sultan�s raid was expected. But the raid never took place. Just 8 miles away is Alappuzha, a populartown filled with backwaters. Many tourists and locals enjoy boat rides on the scenic waterways that open up to the Arabian Sea after meandering through as channels and lagoons. The deity here is Goddess Bhagawati, the divine mother who cares specially for those suffering from mental illness. They are brought to this temple in numbers, and many of them get cured. As Devi is worshiped along with Vishnu the devotees address them together as Lakshminarayana. Devi is worshipped as Saraswati in the morning, Bhadrakali at noon and Durga in the evening. This is the most popular temple dedicated to Lord Krishna in Kerala. Many weddings are conducted with just the basic rituals at the outer area of this temple and people of any religion can attend the ceremony. The east "nada" is the main entrance. The majestic 'Deepasthambham', 7 metres high with 13 receptacles for lamps gives a radiant look after it is lit. Devotees have to pay for lighting it as an offering. 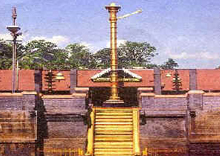 There is a 33.5 metre high gold plated 'Dwajasthambham' for hoisting the temple flag during religious festivals. A group of volunteers and officials guide the devotees as the temple is crowded on most occasions. A special 'thulabharam' as offerings to God by parents who weigh their children in terms of kind (banana, jaggery and coconut) and give the same to the head priest. The temple is invariably crowded almost every day and hence, the authorities help in forming the queues to enter. There are special entry lines for senior citizens. Being such an ancient temple there are many legends associated with its origin and also for some of the annual festivals conducted there. Krishnanattam, a dance drama on Krishna�s childhood, is enacted once a year. It is not allowed to be staged anywhere else. 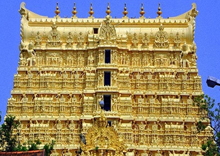 The names of great singers of south Indian music, Sanskrit exponents and Malayalam poets are associated with the temple. Guruvayoor temple is known for its healing prowess and granting the sincere wishes of devotees. An ancient shrine of Lord Shiva that is quite popular among the people in the locality and nearby areas. According to history, the temple was abandoned for some time and was restored by Vilwamangala Swamy who has done much to restore a number of Kerala temples in need of care and uplift. It is said that renovation was carried out in the 16th century and since then the temple has flourished with steady stream of devotees. The sanctum is circular in shape with a conical copper plated roof. The idol of Lord Shiva faces the west which is unusual and is said to add to the power of the presiding deity. Carvings and murals on the walls are exquisite.A golden staff that is visible from a distance is at the front entrance of the temple. 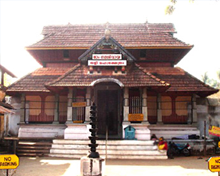 The Shiva temple was constructed by the Zamorins in Kozhikode, north Kerala. There are a number of historical anecdotes on the temple with interesting stories of rivalry, feuds and release from divine curses which made this temple a popular subject in folklore. 'Revathy Pattataanam' a confluence of Vedic scholars used to be held in this temple. A number of literary contest and events are held during the scholars meet and attractive prizes are given. This event of scholars has been recently given much importance as part of reviving the ancient tradition being practised at Tali temple in Kozhikode. It is said the invasion by Hyder Ali and his son Tipu almost destroyed the temple. In 18th century, the ruling Zamorin renovated the temple structure. The inner sanctum is two storeyed with stone sculptures and carvings depicting puranic lore. The temple stands on the side of Brahmagiri mountain in Wayanad at an altitude of 900 feet. It is an ancient Vishnu temple where, according to legend, the idol was installed by Lord Brahma himself. The cold mountain stream Papanasini flows nearby and is known for carrying a number of medicinal herbs that offers effective cure to diseases. A dip in the holy river washes away all sins, according to devotees. Pilgrims take a holy bath in the stream in order to cleanse themselves of various sins and start life afresh. The place where the temple is located is well known for conducting the last rites of the diseased. 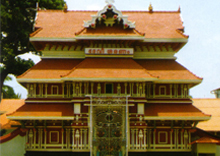 It is a grand temple on a scenic hillock in Thrissur dedicated to Gods Rama, Shiva and Shankaranarayana. Celebrated as the cultural capital of Kerala, Thrissur is known for its religious people who attach importance to worshipping deities according to ancient custom. The temple stands on 9-acre premises surrounded by a fortified wall with towered entrances on all its four sides. The beautiful hillock offers a scenic view of the city below. The grand temple has three exclusive shrines for Rama, Shiva and Shankaranaryana. The circular sanctum is crowned with a conical 'vimanam' (temple tower). The Shivalingam is covered by a mound of ghee used for 'abhishekam', which never melts in spite of all the lamps lit nor does it smell bad. 'Thrissur Pooram' is the most eagerly awaited temple festival with large congregation of devotees, folk artistes and caparisoned elephants along with the synchronised beats of 'chenda mela' (traditional drum beats of Kerala). A Devi temple to the left and a Krishna shrine to the right of the vast premises also take part in the Pooram celebrations at Vadakkunathan temple. All the town folk take part in the grand Pooram held in April offering a spectacular visual treat for visitors. This hill abode of Lord Ayyappa is one of the important pilgrim centres of Hindus. The temple is located at an height of 1,565 feet above sea level amid dense jungles on a mountainous terrain, an extension of Western Ghats. Lord Ayyappa also known as Sastha was born as the result of merging of the power of Lord Shiva and Lord Vishnu. He resides in the Sabarimala shrine.As a young prince, Ayyappa meditated in this place after killing the demoness Mahishi and never returned to his palace. The life of Ayyappa and many of his miraculous powers are famous folklores in Kerala. India's largest annual pilgrimage of over 50 million Sabarimala devotees occurs here from December to January. Ayyappa devotees have to observe strict daily routine chores for over a monthbefore undertaking the arduous journey to the hill shrine. Women between the age of 10 to 50 are not allowed to enter the premises. Before the advent of modern transport, pilgrims used to climb the mountain facing many hardships on the way due to treacherous path. It used to be a long trek on rocky and difficult terrain in dense forests to reach the hill shrine of Lord Ayyappa. But now the foot travel has decreased. But still the last few kilometreshave to be undertaken by bare foot. Ayyappa shrine at Sabarimala is not open to visitors daily. Only during the days of Mandalapooja (15 November to 26 December), on Makara Sankranti, and the first 6 days of all Malayalam months does the temple stay open for devotees. There are lots of temples in Kerala. Please consult your tour operator for planning your visit to these places of worship. 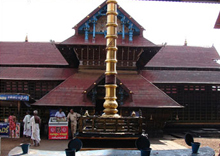 Kerala temples observe strict rules and regulations. All men have to remove their shirts and wear dhoti while entering temples. While womenfolk must wear only saris. It is a must that you must have a clean and fresh look without any bad odourfrom your body. For Keralites follow high decorum and dignity during temple visits. on't litter the temple with waste or discards. Don't fall prey to guides or touts who normally fleece innocent people on the guise of educating them with history or legends associated with the temple.